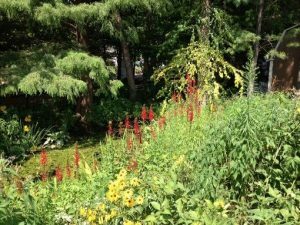 Plants native to Indiana have adapted and evolved to local growing conditions and are best suited for the soil and weather in our area. They require less fertilizer, fewer pesticides, and less water than non-native plants. Native plants also keep soil in place. Their long roots hold securely throughout the seasons including periods of flood and drought. Many non-natives aren’t as deeply rooted. Native plants also grow in a symbiotic relationship, meaning they keep each other in check, ensuring that each species will be available when needed. Non-natives can become invasive, over-crowding native plants. Some crowd out all natives and leave the soil below them bare and exposed to erosion. Native plants and flowers also provide natural food and shelter for wildlife. Natives are attractive additions to the yard. The flowering plants add color at varying times of the season, and grasses form edging, dividers and barriers. Their growth patterns and nutritional content fill the needs of native wildlife. Non-native plants produce attractive blooms and green leaves, but do not provide the nutrients needed by Indiana’s wild creatures.